So unknown to me at the time, one of the reporters for The Guardian Life (the Sunday style pull out of the Guardian Newspapers in Nigeria) had got wind of A Heart to Mend and had written up an article on me and the book. The article was contained in the Edition 222 of Jan 31 - Feb 6 under the spotlight section as shown below. You can click on the picture for a larger image. 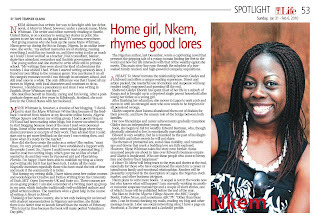 NKEM Akinsoto has written her way into limelight with her debut novel, A Heart to Mend, however, under a pseudo name, Myne Whitman. The writer and editor currently residing in Seattle, United States, is on a journey to seeing her stories in print. She aspires to see her work on big and small TV screens everywhere. Giving reasons why she took up the name Myne Whitman, Nkem said she grew up during the 80s in Enugu, Nigeria. In an online interview, she wrote, “my earliest memories are of studying, reading everything I could lay my hands on, and then trying to play as much as I could. I have worked as a teacher, NGO consultant, banker, skate-hire attendant, researcher and Scottish government worker. She describes herself as friendly, caring and fun loving. After a postgraduate degree and a few years in Edinburgh, Scotland, she now lives in the United States with her husband. How did she then create the niche as a writer? She replies, “most times, I’m very private until I feel I have established a rapport with the people I meet. So, I knew I could never start a personal blog. I used to read two writing blogs, which gave me an idea of what I wanted to do and they were by Favoured girl and Flourishing Florida. I’m happy I have been able to establish my blog as a story and writing site but it has just been luck. I salute all the naija blogsville members especially those who have stood the test of time and made it the community it is today. The Nigerian author, last December, wrote a captivating novel that presents the gripping tale of a young woman finding her feet in the world and how her life intersects with that of the wealthy egoist she meets. This main story line runs through the subplots of a tear-soaked family reunion and high-powered company acquisitions.